over the summer by the Quality Assurance Agency. Such investigations are uncovering the globalized nature of ‘essay mills’. Like other Western universities, the UK is producing graduates – not many, but some – whose grades have been achieved with the unacknowledged support of others – including, we now know, some of the best and brightest of the developing world. Consider for a moment the geo-politics of this situation. The great – or once, as the case may be, kind of great – Western countries are lurching towards insular, anti-immigration policies. Trump wants to build a wall around the US; Brexit may achieve the same thing rather more effectively for the UK. And yet, as governments try harder than ever to keep immigrants out, there are ‘home’ students breezing through university on the back of their own capital and the intellectual labour of the youth of the developing world. Let’s imagine some of those who graduate on the back of such arrangements slide into politics – another field, it’s fair to say, where mendacity is rewarded – and as a result have the opportunity to argue afresh against immigration. Why would they do otherwise? The current prejudices work quite well for them. Yep, something about this scenario screams ‘colonialism in the twenty-first century’. Think for a minute about how those essay-writers might more effectively be using their time, doing the much more important work of developing their own countries. But it’s more lucrative to be helping the rich Western kids cheat than to be transforming lives and nations at home. What’s the QAA going to do about it? The neo-colonial model is obviously just one of many; in truth essay-writers for hire can be found anywhere in the world. So what’s to be done? For those of us teaching in the great Western universities, how do we confront the reality that some – and it’s absolutely critical to remember that it’s just some, not many – of our students are buying their essays. What’s to be done about the essay mills? working with UK universities and the NUS, and also with international agencies, to identify best-practice in deterring this particular form of plagiarism. But I think there’s another approach. I call it ‘trust’. If we take a step back and look at higher education in rational economic terms, it becomes quite reasonable for a student to say: ‘I’m spending many thousands of pounds/dollars/etc. to acquire a certificate than will have a material impact on my career prospects and earning potential. In this context, why not spend some more to ensure the best possible result?’ Is this not simply a rational response to a marketised and utilitarian model of higher education? And now consider how most UK students are already subjected routinely to trial-by-Turnitin, to detect the forms of plagiarism that remain detectable. This practice positions every student as a potential plagiarist, and the student-teacher dynamic as a game. One rational response is to find ever more clever ways of cheating. Hence the essay mills. But what if we work against such structures of reason? What about if we assert a different model of higher education, founded on honest and respectful exchange between the teachers and the taught? This is not especially radical; it’s a model of higher education that has been around for centuries, and continues to this day. It’s just that now we need to think about it a bit more explicitly, and maybe fight for it a bit more rigorously. In my department we don’t routinely use Turnitin. We trust the students. We have a version of an honour code, which boils down to a commitment to values of integrity, civility and trust. And these values were selected very much because they do not focus purely on a utilitarian gain (i.e. reducing plagiarism), but set out rather to define a community. It seems to me that people who feel part of a community are less likely to break its codes. Ok, I nicked this one from the Times Higher. Good, though. I’m sure, as a marker of essays, that I’ve been duped over the years. That pisses me off as much as anyone. But I’m equally sure that the building of academic communities of staff and students, based on mutual trust and respect – not to mention the personal integrity that underpins most students’ drive to succeed – is just about the most effective means through which we can combat cheating. That will sound like utopian thinking to many people. I can handle that. In the meantime their answers of ‘us and them’, and their new technologies of plagiarism policing are not exactly fixing the problem. They may even be making it worse. This blog-post is all my own work. According to a front-page article in The Times last Saturday, there’s an ‘epidemic’ of plagiarism in British universities. Such public attention to plagiarism, the average academic might assume, has to be a good thing. Y et there was also a lot about this article, and associated editorial, that stuck in my throat: not least the latter’s conclusion that ‘the answer … must be the assumption of possible wrongdoing’. Surely there has to be a better way. Of course, if The Times really wants to involve itself in public discourse, it would go open-access. For what it’s worth, a trace of the article is here. Then The Independent repurposes it – all its own work, kind of – here. And the Huffington Post – ditto – does the same. If you want to read The Times, I’d recommend picking up a copy for free when you spend £5 in Waitrose on a Saturday. In my opinion its recipes are more manageable than The Guardian’s. I’d also suggest that if The Times wants to be taken seriously it should get some advice on statistics. Is there really an ‘epidemic’ of plagiarism? We’re told that there have been 50,000 recorded cases of cheating, across 129 universities, over the past three years. But they provide no comparator data, either for previous periods or other countries. It’s also pretty obvious that different universities interpreted the data requests differently. I just can’t believe, for instance, that there is 59 times more cheating at Kent than Lancaster. (I mean, didn’t it even occur to them that this just might be bonkers?) Nor did the journalists consider the possibility that, if the figures actually have risen, we might simply be getting better at detecting plagiarism than we were in the past. Nonetheless, plagiarism happens, at all levels. Vice-chancellors have lost their jobs over plagiarism; students are perhaps no more nor less dishonest than any other group of people, and plagiarism is the cheat’s way to success in an academic context. I’ve spent a lot of time, over my years as a lecturer, pursuing and prosecuting plagiarists. I appreciate the frustration and the rage. But I still think that an assumption of potential guilt is wrong. Academics, somewhat awkwardly, hold dual roles on this front: we are educators, supporting individuals in their learning; and, when the circumstances demand it, we are police. But I think it’s critical to be educators first, and therefore to start from an assumption that our students are honest and keen to learn. To assume guilt is to create universities of us and them, police and criminals. But this is not to suggest that we should do nothing. Several years ago I visited an American liberal arts college, where a student declared that they don’t have invigilators in exams, because nobody cheats. When any student enters the college, she (it was a women’s college) signs an ‘honour code’. Thereafter, any offence against that code is considered an offence against the body politic of the college. When offences do occur, they are ‘policed’ by students and staff together. Granted, liberal arts colleges are unique environments: small, privileged, socially and academically intense. But how might this model help us rethink our approaches to ‘academic discipline’? What would happen if we started with trust rather than suspicion? These questions led me, when I had some control over this sort area at Exeter, to develop ‘The Exeter Ethos’. 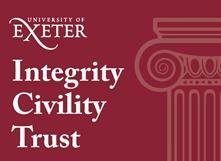 Working with a group of staff and students in the College of Humanities, we identified three key values: integrity, civility, trust. We then asked ourselves what this ‘ethos’ might mean in practice. One commitment we made, as a result, was not to assume plagiarism, and in practice not to use turnitin. Actually, I think there are all sorts of reasons not to use turnitin. It promises more than it delivers, and does nothing to catch the most insidious form of plagiarism, the essay mills. But the principle is critical: as members of an academic community, we begin with the assumption that we are all behaving ethically. I’ve written before about utopian thinking – and I’m aware that 2016 is the 500th anniversary of More’s masterpiece – but I think this is realistic. The key challenge, of course, might come from colleagues in departments with high numbers of international students, and hence with student communities that are far more diverse than anything I have ever experienced. I don’t entirely trust the data in The Times, which liberally casts aspersions on students from particular countries; however, there’s no question that many international students come from different cultures of learning, and are under huge pressures to return home with a degree. Some cheat. These contexts present us with very real challenges. Universities are changing. But perhaps this gives us more reason than ever to insist upon our core values – our ethos in an academic community – and commit ourselves to educating our students in these values. That’s not always going to be easy, but it seems to me not only preferable to the alternative, but also an ethical way of handling people who are paying a lot of money for their education. Sceptics will be wondering what has become of the Exeter Ethos. Well, it’s still there; although, to be honest, it hasn’t achieved the prominence we hoped. We anticipated embedding it into the curriculum; we planned, also, structural changes, such as training students to be involved in disciplinary panels. But momentum lapsed: academics move from role to role (as happened to me), and I’ve learned that something like this requires institutional commitment over years to ensure it becomes embedded in a culture. But I’m not abandoning the optimism that brought it about. An assumption of guilt is no place to start in educational relationships.